Hello, my friends! I first want to apologize for the radio silence. I've been incredibly busy since school started, and Monday was my first day back at my on-campus job. I know, it's an old and very lame excuse, but it's all I have. I will do better. Also I've been faithfully art-journaling, and I'll have pictures for you soon. Bear with me! Second, I want to welcome the lovely Miss Lisa to my blog once again! Lisa has just begun her freshman year of college, but somehow managed to write a second very well-researched, humorous, and well-written post for me, so let's give her a round of applause! If you missed her first guest post, you can find it here. And again, if you're interested in seeing more of Lisa's writing, hop over to her blog, This New Adventure, and take a look at her thoughts on inspiration, college, cats, and the ALS Ice Bucket Challenge. I am simultaneously writing this post and watching season 5 of Doctor Who (which, like, yes Matt Smith BUT I NEED DAVID TENNANT BACK), so just know I am going to reference Vincent and the Doctor approximately 145837 times in this post. Anyway, back to Van Gogh, he had a pretty difficult life. As a child, his parents got to frustrated with him that they sent him to boarding school. Unfortunately, he got kicked out because it didn't exactly improve him like they thought it would. So then he went and got himself a job as an art dealer. He wasn't bad at it, But he kept arguing with customers and he didn't like his coworkers so he quit. He went to school again, but he kept failing his exams. He became a minister in Borinage, which he was actually pretty good t. He cared so much for the coal miners in the community he lived with, that he was always giving them his stuff, even though he didn't have much for himself. Pretty decent thing of him to do, right? Yeah, well, it got him fired. Out of luck again. But we have now found ourselves at the point where he decided to become an artist. Last time, I talked about the raging war between the grumpy old Neoclassicists and the hipster Impressionists. Well, at this point, Impressionism was the big thing and it was leading into a form of art called Expressionism. Expressionists didn't want to display truth through their paintings, they wanted portray emotions. Goes with the whole patter of every other kind of art form. Stuff about God, to stuff about truth, to stuff about emotions. Next is stuff about fantasy and surrealism. 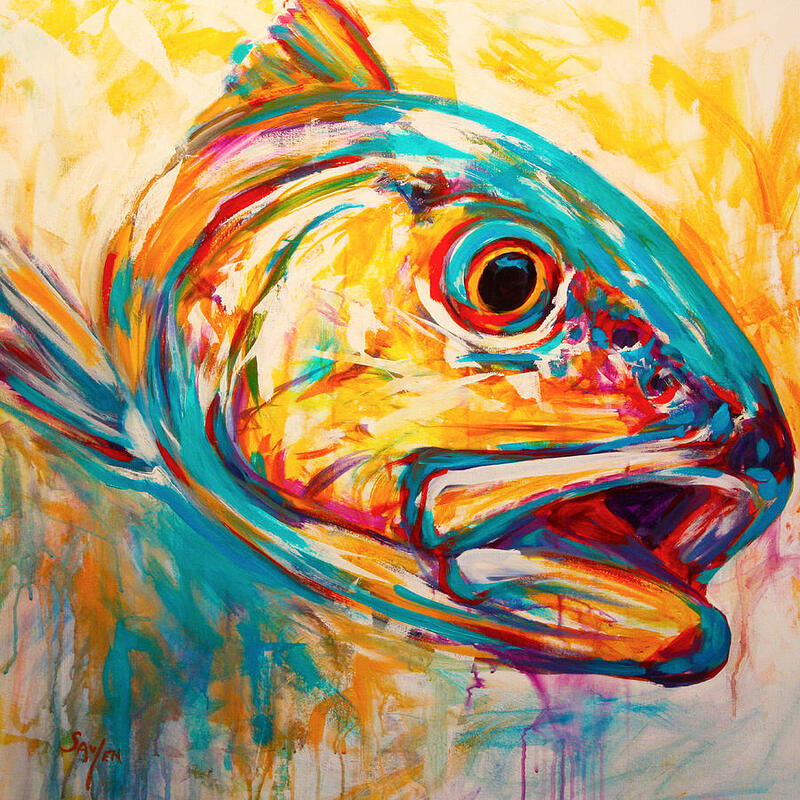 So anyway, as an example of Expressionism, here is the painting "Redfish" by Mike Savlen. I suppose this fish is supposed to emote an emotion (does that even work as a sentence? You can tell I'm such a professional writer) but I can't really tell what it is. Blind panic, maybe? Or maybe he's having an existential crisis. You decide. Getting back to Van Gogh, his later life was pretty much as miserable as his early life. He ws 27 when he decided he wanted to be a painter. During the 10 years he painting, he created over 1,000 works. 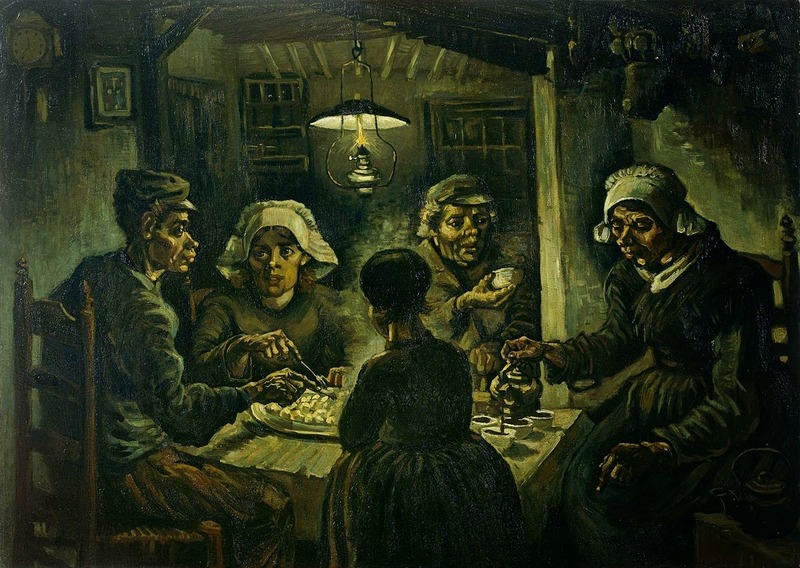 His early works were in darker colors, depicting the normal lives of people, like this one called "The Potato Eaters". Later he started painting his more famous works, which used brighter colors and curved brushstrokes. Obviously his most famous painting was "Starry Night", which I'm not even going to bother showing you because literally everyone already knows what it looks like. 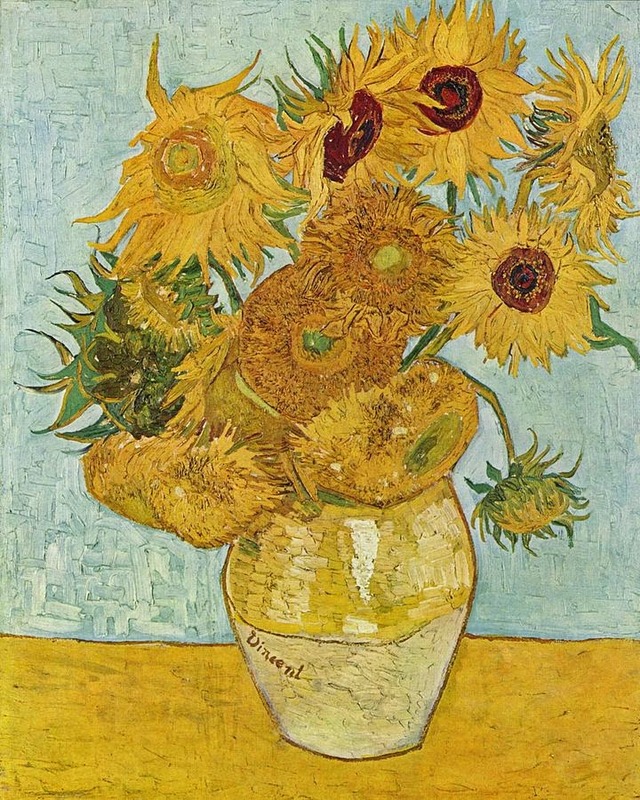 Another one of is his famous ones is "Sunflowers" which of course we all know is actually inspired by Amy Pond. It is well known that Van Gogh was mentally unstable for most of his life. What his exact illness was, we're not exactly sure. Some claim depression, others claim epilepsy, still others say he got lead poisoning from all the lead paint he was using. He was very close with his brother, Theo; he even lived with him fore a while, but Vincent's mood swings made their relationship very strained. Still, he needed to maintain their relationship since Theo sent him most of the money he used to buy paint supplies, and he didn't have nay to spare. Sometimes he even skipped meals in order to spend more money on paint. To paraphrase what Ron Weasley once said, "He needs to sort out his priorities." Ten years after he started being a full-time artist, he shot himself. 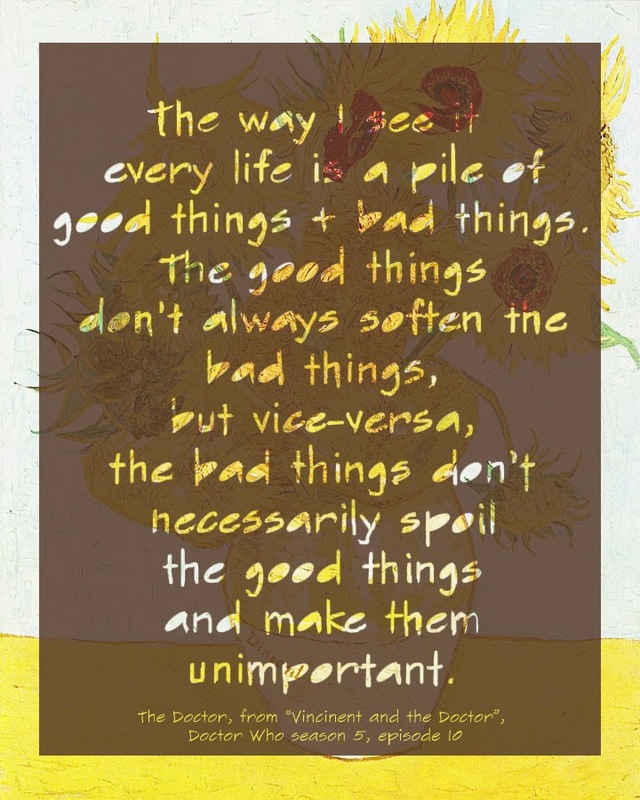 I read somewhere once that he killed himself by drinking yellow paint, because yellow was a happy color and he wanted that happiness inside him. Although I half-hoped this was true, I'm sure I knew somewhere in me that it couldn't possibly. That type of tragically romantic stuff doesn't really happen, let's be real here. Van Gogh was crazy, but he wasn't dumb. Some people say he did ingest paint, but I haven't been able to find out if it was actually true or not. Whichever way you spin it, Van Gogh had a pretty depressing life. Even with all his hard work, he only sold one painting in his lifetime. Yet, while hard lives are pretty terrible while they're being lived, when they're over they make pefect fodder for tragic stories and don't we all love those. Van Gogh became the poster boy for tortured artists. It wasn't until after his death that people started appreciating his art, and now his paintings sell for over 50 MILLION dollars. I probably haven't told you anything you didn't know in this post. But I learned a bunch, so I think it was worth it. 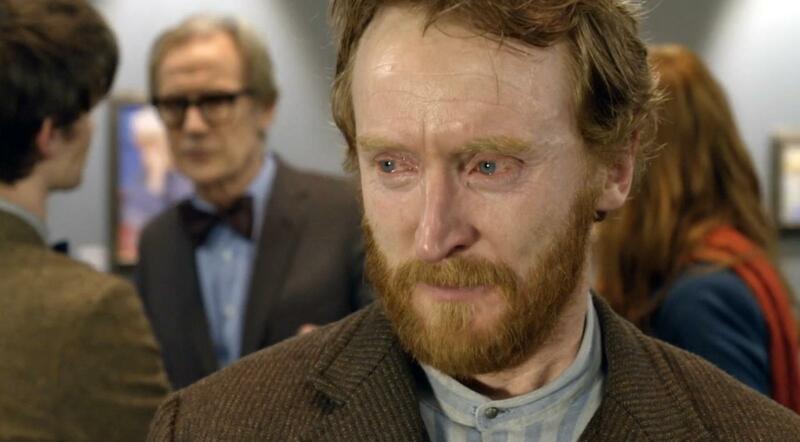 I'm going to go watch "Vincent and the Doctor" now and cry for a while. Thank you so much, Lisa, for bringing another great story of an artist to all of us here at See Cailey Color! Van Gogh is one of the many artists I mentioned in my last post. Though it's not clear what mental illness or illnesses he had, it is clear that it was a great struggle for him. If you want to learn more about mental illness and artists, go check out the National Alliance on Mental Illness and this article on Mental Illness and Creativity. If you're battling depression and suicidal thoughts, please check out the Suicide Prevention Lifeline. Van Gogh was gone too soon, and we don't want to lose you, too! What do you think about Vincent van Gogh? Which of his paintings is your favorite? Share it in the comments! "Vincent Van Gogh (1853-1890)" The Department of European Paintings in associated wth the Metropolitan Museum of Art.